« Points, World’s, and NYC Tri, Oh My! I know it’s been a while since an update, and one is coming soon. But I’m taking a break from regularly scheduled triathlon programming to talk about a huge project that my “other job” has just launched. Most of you know, I spend most of my non-training, non-family time leading an energy bar company, Picky Bars, that Lauren, Steph Rothstein and I started about 4 years ago. Well, we just launched a new website, a massive update to our subscription service – The Picky Club – and new packaging that let’s ANYONE be on our bars by submitting pictures to us on social media. I’m super proud of the team and the work behind it. I’ll update you all on triathlon stuff early next week, when I should hopefully find out for sure that I’m IN at 70.3 Worlds. Until then, here’s some biz story for you! When we started Picky Bars four years ago, there wasn’t a whole lot of “strategy” behind it. We didn’t put together a 10 slide presentation, dress up in business suits, and promise investors a 10x return. In fact, my biz school professors would be ashamed at our lack of market research and pro-formas. I don’t think we did one SWAT analysis prior to our first product launch! Impossible! Instead, what happened was – I needed some bars, so Lauren and Steph made some. They tasted really freaking good and were really healthy. We put them in bags with dorky circular labels I made in Powerpoint (MBA all the way). We put up a website and started selling. It’s amazing Picky Bars didn’t take off immediately, given these initial labels I designed. What we created, did and said over the first two years was just the result of Lauren, Steph and I (and Loren Polster, my cousin and our first F/T employee ). We were just being ourselves, learning as we went along, having fun, and were intimately involved in every marketing program, decision, recipe, and bombilicious word we came up with. Somehow, amazingly enough, it worked. It’s freaking science, dude! But in the last 18 months, it’s become impossible for us to be involved in every single aspect of the business. Picky Bars has matured. We no longer make the bars 40 hours a week in our house – thank God. We have “real business” things like an office, five employees, and a couple of desks – some with office supplies in them! We have financial reports on spreadsheets and legal counsel who makes sure we don’t do something illegal. I know, it’s crazy. We also have lots of awesome customers, and even a few big ones. Our baby is all grown up. Or at least it’s in grade school. As a business owner this growth is, of course, exciting. But, it’s also very scary. You start to reflect on what you did to get this far. And you realize how hard it will be to contain whatever that is, communicate it, and reciprocate it as the company becomes less about your individual actions and more about the actions of employees, customers, and partners you bring on the ride. So I decided we needed to pause for a couple of days, and do our best to figure out what Picky Bars was all about. And like any good CEO, I organized our first ever “corporate” retreat with the entire company – 9 people, including Steph’s husband Ben, and in-utero Jude. We stayed in Sunriver for two nights, ran, rode, drank beers, and played games. But mostly, we talked. A LOT. PIcky Bars retreat in Sunriver: trying to figure out what we’re all about. – Dream, Support, Trailblaze, Enjoy it. The first “instagram” package features Lauren’s friend Georgie on an epic run in Australia. It’s also a new flavor – Cookie Doughpness! At the core, we’re dreamers – I dreamed of being a professional athlete, Lauren & Steph dreamed of being entrepreneurs. We supported each other to fulfill those dreams, and maybe most importantly, had the support of countless friends, family, fans, and customers at each step along the way. We used fearlessness and confidence to trailblaze our own path. Steph told Runner’s World we had a company before it really existed! Lauren was forced to remove a Picky Bars tattoo minutes before the NY Marathon and started an athlete movement. Instead of taking investors to do a national rollout, we kept the company ours, and created our own distribution model – the Picky Club – that uniquely catered to our awesome community of supporters. Finally, while there certainly were some tense and very sucky times along the way, through the thick and thin we always enjoyed it. We believed that you could seriously pursue ANY goal without taking yourself too seriously. The pursuit of any dream should be rooted in enjoyment, and that’s something we’ll always be about. After the retreat, we challenged the team to develop some new ideas around what our website and packaging might look like if we decided to do a refresh based on these values. Sure, our current stuff was great, it’s homemade, quirky, fun, smart. But we felt like it was missing that aspirational, trailblazing and support side. No guarantees we would change anything, but let’s see what we come up with. The first design I saw shocked me – in a good way. I loved it. It was fun, original (trailblazing), aspirational, and most importantly, provided a super cool and unique opportunity to reciprocate the support our customers have given us. Now, anyone can be on the Picky Bars packaging. We can support others trailblazing, having fun, and pursuing their dreams. I think that’s pretty freaking cool. We’ll put new images from customers and fans on our packaging every 3-4 months. It’s going to be awesome! We also took the feedback from our core Picky Clubbers, and made it possible to increase or decrease the number of bars you want by month. So you can now vary your Picky consumption based on your training load or general hunger! 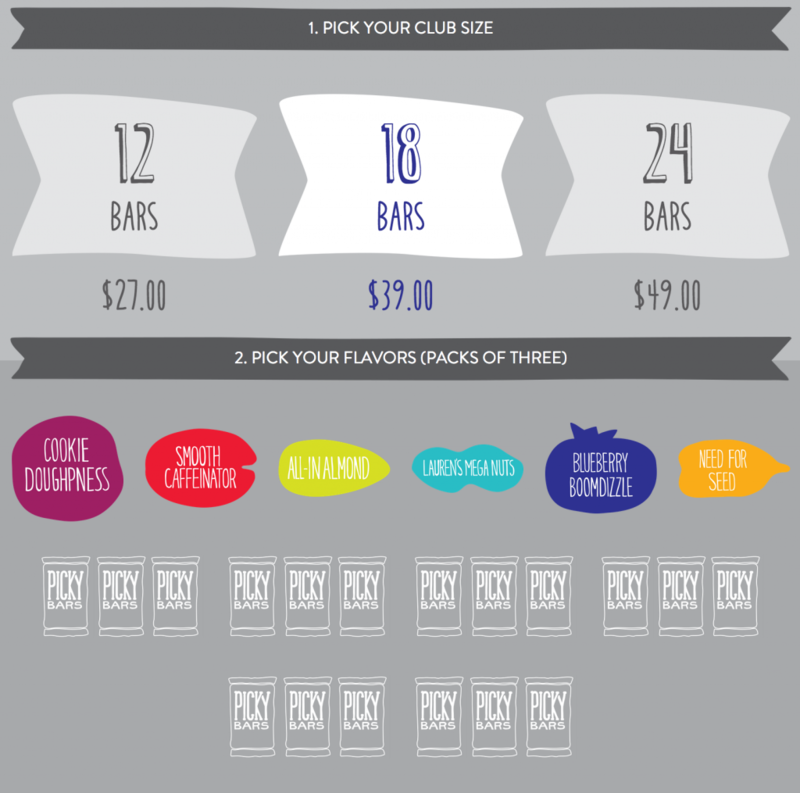 The new Picky Club lets you choose how many bars a month you want, and change whenever you want. It’s also feels a little like video game. Booyah! Finally, we have a more visual website and blog that better allows us to tell the stories of where our customers go and what they do that inspires us. We hope that this content helps inspire you to pursue your own goals and enjoy the most of Picky Life. 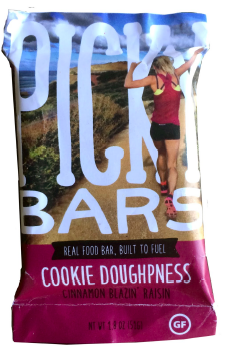 I believe the new Picky Bars branding is an amazing reflection of what we’re about and where we want to go, and I hope that what we’ve done resonates with you as well. Mostly, I hope we can continue to support you all in your dreaming, trailblazing, and fun-having the same way you have supported us for this past four years. Thank you so much, and let us know what you think! Much love to you all! Keep up the good work. Agreed! We need an app. It’s in the development plan for sure. Hopefully we’ll have one for the Picky Club members soon. Thanks for the idea! I just wanted to say I am HUGE Picky Bar lover. I run trail ultras and Picky Bars (especially Lauren’s Mega Nuts) help me through every.single.time. I eat one 30 minutes before any long run. While I am not (yet) in the Picky Club (I work at a running store in Northern, CA and we sell Picky Bars) … I plan to be a club member in the near future. I love your products, message and history. Thank you! I was blogging about you guys during my American River 50 Mile training months … looks like it is time to give you guys some more love on the old blog. 🙂 Oh and PS: Sunriver ROCKS! What a place to unwind. Cool stuff! I live in Delaware and did a very small local tri at the beginning of the season. The guy who was racked across from me was wearing a Picky Bar shirt. I commented on it to the 2 people who came with me. 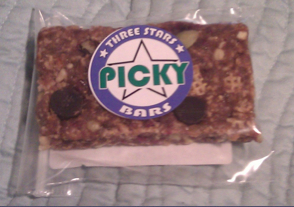 Which means that at least 4 people at this tiny tri in my tiny state knew about Picky Bars. I think that’s a pretty solid metric that should be added to your next report. It’s awesome and inspiring to read how you and the team have guided Picky Bars through different situations and stages of development. I also love seeing the original packaging–it’s easy to tread along and get caught up in the current set of challenges and obstacles, but looking at the first wrapper and package really provides tangible evidence of the company’s progress. The new website is very impressive and I think everyone will enjoy the fun customization options (packaging and bar selection). Nice work, and best of luck as you enter the next stage in the Picky Bars growth spurt!